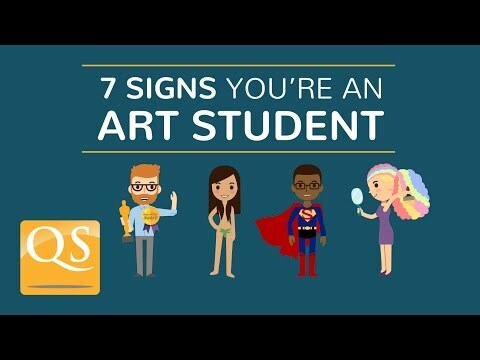 So, you’ve gone against your parents’ suggestion of studying engineering and opted for an arts degree… Fortunately, there are numerous scholarships for art students available around the world, including funding to study art, fine art, design, fashion design and graphic design. The first challenge in gaining a scholarship is finding all the relevant opportunities, so we’ve bought together a selection of art scholarships worldwide, to make finding funding that little bit easier. If none of the art scholarships listed below is suitable for you, another great starting point is to consult the scholarships listed on the websites of the universities or institutions you wish to study at. You can also find creative writing scholarships here, and we have a separate list of scholarships to study at the 10 highest-ranked art & design schools (based on the QS World University Rankings by Subject 2018). Art and design Scholarships @ UNSW – Various art scholarships for students of all levels enrolled at the University of New South Wales, Australia, in the department of art and design. International students are eligible. Art, fashion and textiles scholarships @ RMIT University – A range of scholarships for students currently enrolled in an art, fashion or textiles degree at RMIT University. Brett Whiteley Travelling Art Scholarship – Art scholarships for Australian citizens to further their arts education in Europe with a three-month residency at the Cité Internationale des Arts, Paris and AU$30,000 to attend art school at an accredited institution in Europe. Brucebo and W.B. Bruce Fine Arts Scholarships for Canadian Artists – Fine arts scholarships reserved for young Canadian art professionals wanting to take up an art residency or to conduct arts research in Gotland, Sweden. Chase AHRC Studentship – Arts scholarships to study at selected liberal arts schools and universities in the UK, funded by the AHRC and open to UK and EU students pursuing study in the visual arts, media, film and other arts and humanities subjects. Courtauld Postgraduate Scholarships – Graduate art school scholarships to study at the Courtauld Institute of Art in London, UK, on the MA, PhD or Conservation programs. The process for 2017/18 is currently under review. DAAD Fine Art, Design/ Visual Communication and Film Scholarships – Fine art and design scholarships funded by the DAAD and open to international students who have gained a first degree in a related field. Scholarship winners will gain funding for study in Germany on a master’s degree or postgraduate program. ECA Taught Masters Scholarships @ University of Edinburgh – Graduate scholarships for art students offered by the University of Edinburgh in Scotland, UK, for master’s level study in the schools of architecture, art, design, history of art or music. Middlesex University London Arts and Creative Industries Scholarship – Four scholarships are available to study a master’s degree at Middlesex University, covering up to half of the tuition fees. Open to UK/EU students (and international students who are an alumnus of the university). Norwich University of the Arts – A range of art and design scholarships to study at the university. Royal College of Art Awards – Various fine art scholarships on offer from the RCA and partner funding organizations. Scholarships are awarded to enrolled students. Slade School of Fine Arts James Lewis Foundation Scholarship @ UCL – Open to a UK student studying a BA or BFA in Fine Art at the UCL (University College London) Slade School of Fine Arts. More scholarships to study at UCL can be found using its search tool. Swiss Government Excellence Scholarships for Foreign Scholars and Artists - Postgraduate scholarships for art students, professionals and researchers to study at doctoral/postdoctoral level in Switzerland at a recognized institution. University of Westminster School of Media, Arts and Design Scholarship – One scholarship is available for an international student from a developing country who holds an offer to study a full-time master’s degree within the School of Media, Arts and Design at the University of Westminster. Provides a full tuition fee award, accommodation, living expenses and flights to and from London. ARC Scholarship Competition – An art scholarship competition for students at ARC-approved art schools in North America to gain funding for their art education. You will be required to submit an example of your artwork – a classical-style life painting or sculpture – as your competition entry. Archibald Rutledge Scholarship Program – US art school scholarships for students from South Carolina to gain funding to study creative writing, dance, music, theatre, or visual arts at an accredited university in the state. Arts for Life! Awards – Annual awards of US$1,000 are available to graduating high school seniors in Florida who demonstrate excellence in creative writing, dance, drama, music or visual art. Berlin Arts Scholarships – Scholarships for art students with affiliations to the region of Northeast Pennsylvania in the US. Open to serious art students interested in painting, sculpture or photography. Krylon Clear Choice Art Scholarship – US$1,000 art scholarships from Krylon awarded to citizens of North America studying an accredited visual arts program in North America. Lamar Dodd School of Art scholarships @ University of Georgia – Various art school scholarships to study art at the University of Georgia in the US. Open to US and international students. Naomi Winston Scholarship in Visual (2D) Art – Art scholarships from the National Society of Arts and Letters (NSAL) in the US, open to US citizens aged 16-22 wanting to further their 2D visual arts education outside of university. College of Design @ The University of Oregon – A range of art scholarships for both undergraduate and graduate students to study art, painting, sculpture and other related programs at the University of Oregon. Wendy Jackson Hall Memorial Scholarship – Arts scholarships for US students graduating from high school in Washington state and wishing to continue their arts education in the US. Worldstudio AIGA Scholarships – Scholarships for art students from minority and disadvantaged backgrounds to study at an accredited institution in the US in the field of fine art, illustration, graphic design and motion graphics. BestReviews Design Scholarship – Two design scholarships of US$2,000 are awarded per year to students enrolled in an accredited school program. To enter, you'll need to write a 500-word essay on product design. Open to international and US students. FIDM National Scholarship Competition – US design scholarships from the Fashion Institute of Design and Merchandising (FIDM). Open to US citizens enrolling in fashion design, interior design, graphic design, visual design or digital media at the FIDM in Los Angeles. Print and Graphics Scholarship Foundation – Graphic communication and graphic design scholarships for students enrolling on a two- or four-year program at an accredited US institution. The Liz Claiborne Design Scholarship Award – Fashion design scholarships based solely on merit offered by the CFDA (Council of Fashion Designers of America). Open to students enrolled at design schools and accredited universities across the US. TwoTen Footwear Design Scholarships – Fashion design scholarships for students pursuing a career in footwear design in the US. VCU Graphic Design Scholarships – Various graphic design scholarships offered to enrolled students at Virginia Commonwealth University, School of the Arts, in the US. ECA Taught Masters Scholarships @ University of Edinburgh – Graduate scholarships offered by the University of Edinburgh in Scotland, UK, for master’s students enrolling in the schools of architecture, art, design, history of art or music. Istituto Marangoni Scholarships – Fashion and design scholarships offered by Istituto Marangoni, an Italian fashion school with campuses across Europe. NABA, International Academy of Arts and Design in Milan – Scholarships to study Bachelor of Arts programs in design in English or Italian at NABA (covering 40 percent of tuition fees) starting in October 2018. The Alexander McQueen Scholarship @ UAL – Graduate fashion design scholarships for EU students enrolling on the MA in Fashion Design at the University of the Arts, London. UAL Postgraduate Scholarships – Various graduate scholarships offered by the University of the Arts, London for students pursuing art and design programs at one of its six colleges. This article was originally published in March 2015. It was most recently updated in April 2018. Hi i am hectorina, i want to Event management and decoratin can i get scholarship for my study? I am turning almost 40 this year and looking for scholarship in Europe and the US...in graphic/UX design. Hi Amina, here are links to our lists of scholarships to study in Europe and scholarships to study in the US. Good day, My sister is studying fashion design in Dalian, China. She really needs scholarship. Please contact me if there is anyone/organisation that is willing to offer scholarship to her. Hi Daniel, your sister may like to check our list of scholarships to study in Asia (which includes options to study in China). We also have a guide on how to find scholarships to study abroad which includes advice on how she can submit strong applications to increase her chances of success. Hi.I am 30 years. From Syria. I am engineer.I have a bachelors in civil engineering - part topography. I am looking for a scholarship to learning English language. I want to studying abroad. I search a English language scholarship. Hi Mohamad, if you'd like to study engineering, you can find a range of scholarships for this subject here, including options to study in English-speaking countries. Hello, I have been following you foe some time now I am looking for scholarship to study Msc in cryptocurrency at university of Nicosia and from south Africa. Please assist. hello I am from ethiopia africa I am 19 years old I am very very interested in fine art I am finished my university entrance exam I am looking for art scholarships HOW CAN I GET PLEASE ?